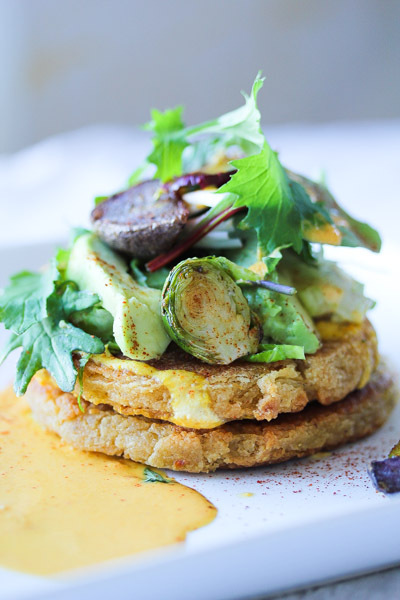 This gluten-free potato masa cake makes a delicious breakfast dish, but would work equally well as an appetizer or light dinner. The pepper cream sauce can be super spicy or mild depending on which kind of pepper you use! Add the masa harina, water, baking powder, olive oil and chili sauce to the stand mixer and mix well. Fold in the whipped potatoes and mix until well incorporated. Form the dough into patties about 3 inches in diameter and 1/2 inch thick. Cooked on an oiled griddle 4 minutes each side. Heat the oil in a cast iron skillet. Add the vegetables and onion and saute on high until the brussels sprouts and potatoes have browned. Turn down the heat and cook until the vegetables are completely done, being careful not to overcook the Brussels sprouts. Near the end of their cooking, add the cumin, oregano and garlic. They should still be slightly crunchy and the potatoes are crisp. Blend well until smooth. Keep refrigerated for up to a week. 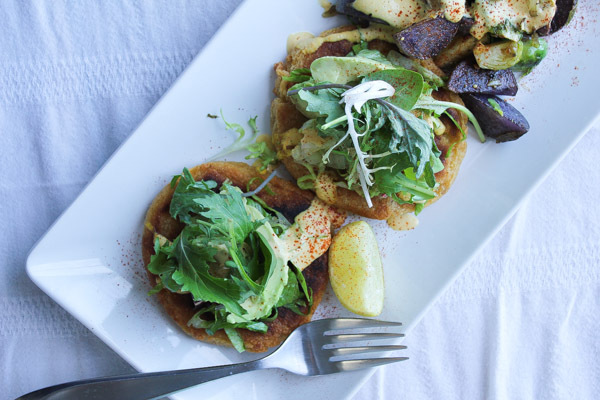 Serve the potato masa cakes warm off the griddle or pan, topped with with the seared Brussels sprouts and potatoes, pepper cashew cream and baby greens. If you like it really spicy add more hot sauce! Love your recipes…could you please share the Portobello Steak with port wine.receipe…it was so so delicious…..!!!!! 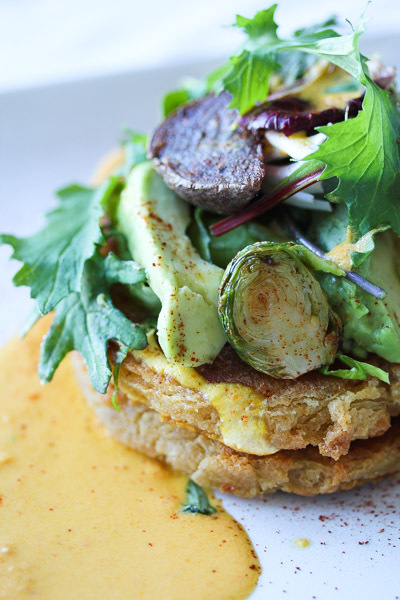 Rachel, Just want to thank you for sharing all these fantastic recipes! Congratulations on your new restaurant! We miss you terribly here in CT — thanks so much for your blog, which keeps our home menu much more interesting.